Samantha walked right into our hearts when she first showed up in a saree in Ye Maya Chesave. That moment still brings a twinkling smile to our faces, and the glimpse continues to melt us all like it did the first time. Samantha Ruth Prabhu has come a long way from that day to now, and it is talent that drove her and just that. With her endearing smile, incredible acting, fashion sense, and a heart that silently gives back to society – this little wonder proves that small is beautiful. Today, let’s look at this diva’s traditional looks and take some saree inspiration. Keep reading to check out the 15 best photos of Samantha in a saree. Samantha’s engagement saree blew everyone’s mind, and not because it was an over-the-top-larger-than-life couture saree. It had their story etched – how it all started and other magical details that are truly profound. Samantha carried it gracefully with a gold off-shoulder top and sparkled her way into marital bliss, giving us all major #goals. Samantha is juggling between big hits, and she is doing it like a boss. She switches gears without a jerk – one day, she wears this uber chic pantsuit, while the next day, she comes out in a saree, giving us major retro vibes and is just as convincing as the previous outfits. Her new summer haircut, the white collared blouse, and the belt all add to a perfect hundred. Samantha is one of the very few actresses who don’t think twice before taking up deglamorizing roles. Vanity takes a backseat for these roles, and she seems to be handling it rather well. Her half saree look for a recent film is proof that aura is what an actor needs to become a star – and she definitely has all of it. Samantha loves handloom. She believes in the cause and has always been pretty vocal about it. She is often seen wearing handloom sarees and spins them to give a contemporary streak. She rocked it in this stripe saree from Archana and Puneet. The high neck blouse, a chunky neck piece, and a belt to cinch at the waist were all perfect accessories. Samantha dazzled at the opening of a jewelry store in Chennai, looking like a million bucks. She wrapped herself up in a full gold pattu saree from Raw Mango and reminded us of actresses from the yesteryears. The half sleeve-high neck blouse, the neckpiece, and the earrings were equally exquisite. 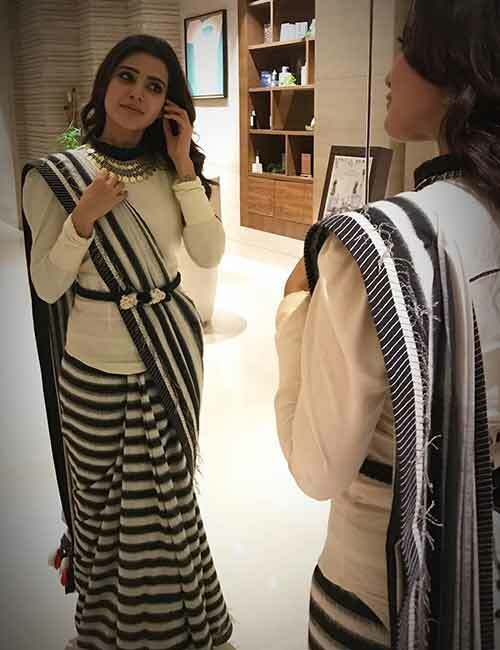 Samantha Prabhu loves everything handloom, and that’s why so many of us root for her. She donned a blue chanderi saree with a simple ikkat blouse and barely any accessories. That’s Samantha for you! Can’t take your eyes off her, can you? Anita Dongre is known for her understated elegance and how she brings about glamor with the most unassuming designs – like this one. The blue printed saree with the pleats neatly tucked in and a halter neck is something I cannot get over for the longest time. Just when you thought this girl-next-door is all about muted snowflakes and rosebuds, she flipped it all with a tribal look and went all out. She set the stage on fire with the JFW photoshoot, and she gave it her everything for all her looks. The tribal theme jacket style saree, mirror work bikini blouse, the dreadlock style braids, the statement neck piece, and her charm married it all perfectly. 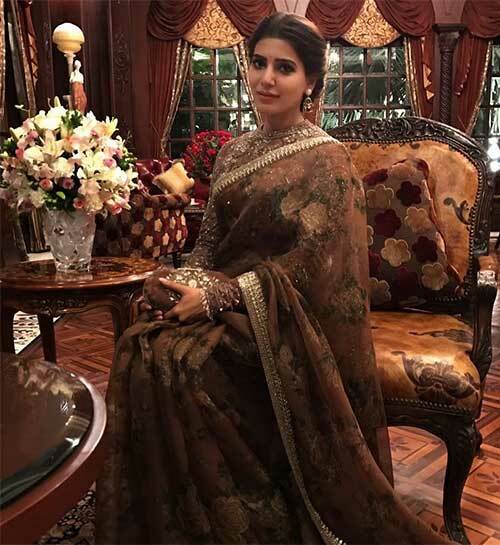 Samantha wore a floral and breezy organza saree from Sabyasachi for Akhil Akkineni’s engagement. Pulling off a look like this is rather tricky because it can come across as dated if not dealt with properly. Samantha gracefully paired it with an embellished full sleeve blouse. A stone studded clutch put her hair in a neatly done chignon updo, and the bindi looked incredibly adorable on her. Ajrakh style sarees are catching up, and like wildfire, thanks to stars like Samantha who endorse them beautifully. She paired the ajrakh print saree with a fully embroidered handmade blouse with half sleeves and a choker necklace. Samantha’s traditional choices are just as elegant as her contemporary ones because she keeps the whole minimalist theme intact, no matter what. The black pattu saree from Raw Mango with a handmade golden blouse, gold drop earrings, and a clutch made her look fabulous. 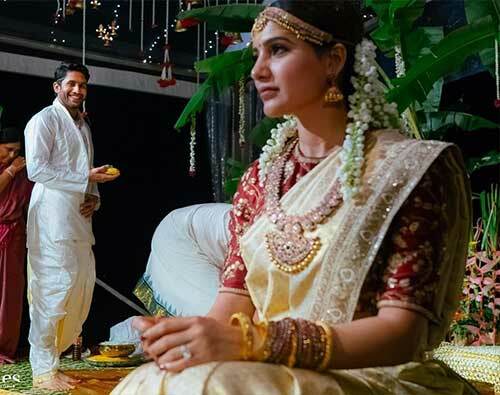 Samantha’s wedding with Naga Chaitanya Akkineni was her dream, and she looked like one. Thanks to social media, she transported us to this wonderland, giving a peek into everything that happened and what she wore while she was living it all up. Her off-white Sabyasachi saree and the red half sleeve blouse, the jewelry, and, most importantly, the twinkle in her eyes restored our faith in love, romance, and happily-ever-afters. 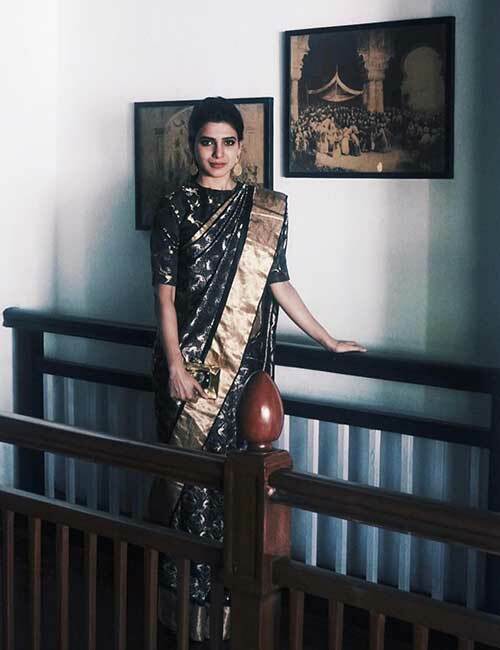 Samantha’s love affair with handloom is perpetual. She has a great demeanor and fits the bill perfectly. 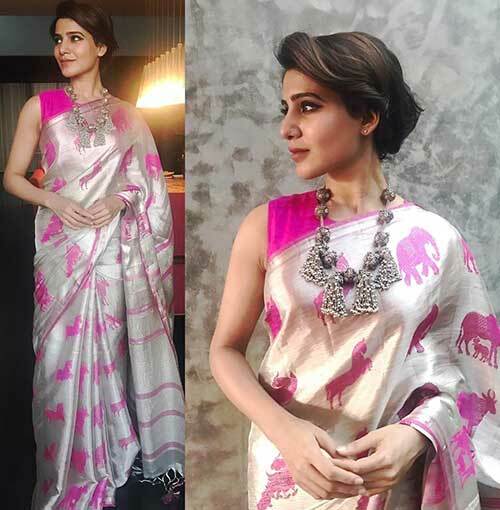 She did it like a pro, yet again, in an elephant motif saree and a sterling silver neck piece with neutral makeup. Brands like Anavila, Raw Mango, etc. have high perceived brand value and put you on a pedestal. Samantha attended an audio launch in an elegant but simple Anavila saree in pink and an off-white high neck blouse. Her silver hoop earrings, high ponytail, and minimal makeup rocked the theme entirely. Here’s another one from her many irresistible looks! This time, it is from Shilpa Reddy’s label. The off-white and gold saree with a signature high neck blouse is something I’m going to try very soon. And I think you should too! 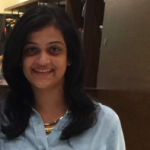 She dresses beautifully – whether it is a saree, a skirt, or a suit. And above all, she has this enchanting smile on her face that is the show stopper. What are your favorite looks of Samantha? How does this diva inspire you? Pick up your jaw off the floor and let us know all about it by leaving a text in the comments section below. 7 South Indian Stars Whose Saree Style Is Worth Stealing!